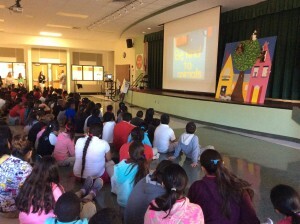 Parkside Elementary School in Naples, Florida rolled out the red carpet for our visit today. The auditorium was filled to near capacity during both of our programs. Students and educators alike we’re thrilled to learn of Bogart’s travels across the United States and how kindness can make a big difference in all of our lives. This entry was posted on Wednesday, January 18th, 2017 at 8:25 am	and is filed under Kindness. You can follow any responses to this entry through the RSS 2.0 feed. You can leave a response, or trackback from your own site.